In this course, you will study the original doctrines of the first century Church. You will also learn how Christ trained his disciples and other leaders of the early Church, establishing the foundation for true Christianity. Through this course, you’ll explore the life, ministry, and teachings of Jesus Christ as described in the four gospels in the context of the social, political, and religious conditions of the first century. 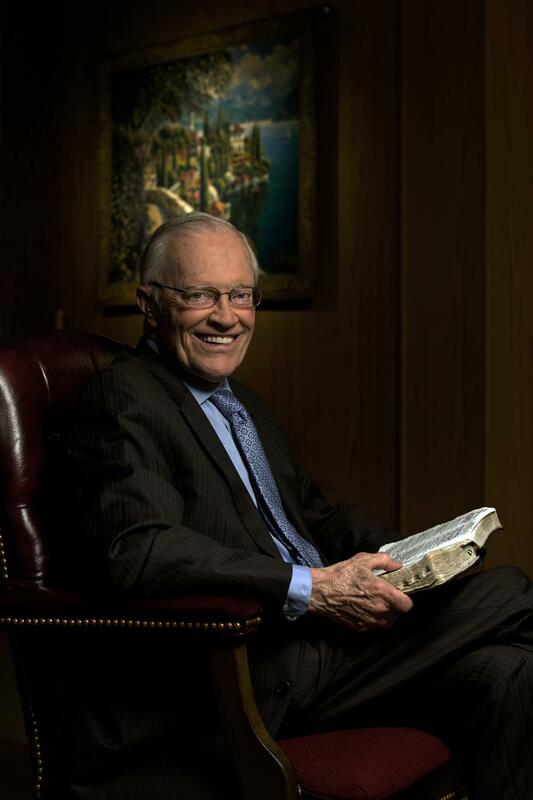 Dr. Meredith was one of the first evangelists ordained by Mr. Herbert W. Armstrong in 1952 and spent 64 years in the Work that Christ began through Mr. Armstrong. He was active in the Work until recent months. The Living Church of God, which Dr. Meredith raised up, has more than 350 congregations in 55 countries worldwide. In this course, you will study how Christ lived and what He taught, as recorded in the four Gospels. These teachings established the doctrines of the New Testament Church, the original Christianity as followed and taught by the apostles and leaders of the early church. The first four books in the New Testament were written by men who were inspired by God to record what they saw and heard of the life and teachings of Jesus Christ. Through these written accounts, we have the opportunity almost 2,000 years later to learn what Christ did and said. 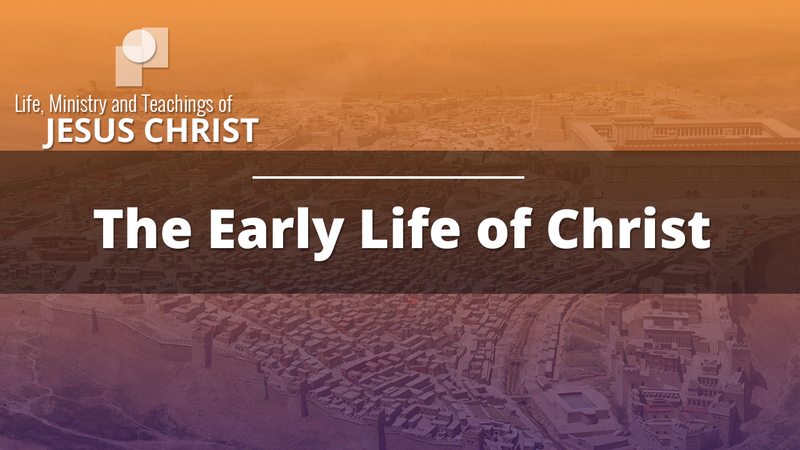 By studying the social, political and religious conditions, we gain insight into the setting of these formative years of the Church that Christ built. And by focusing on the background, purpose and themes of each of the Gospels, we develop a clearer, more complete understanding of Christ and His teachings. What do I need to have to proceed through this course? First, our primary reference is the Bible. Make sure you have your Bible handy to check the references. Second, since we are focusing on the four Gospels and comparing what each adds to the complete picture of the life and teachings of Christ, a very helpful reference book is “A Harmony of the Gospels for Students of the Life of Christ”, by A.T. Robertson. This is the reference book that was used in Ambassador College, as well as Living University for this course. This book is available in different editions, and is quite inexpensive. An online version is also available for free. To access the online version, just click the previous sentence, or go to the “Resources” tab and click on the appropriate link. A number of other references that might be helpful in your study are included in the “Resources” tab. Some are freely available in the public domain. In those cases, links are provided. Other references are books that can be purchased if you wish. 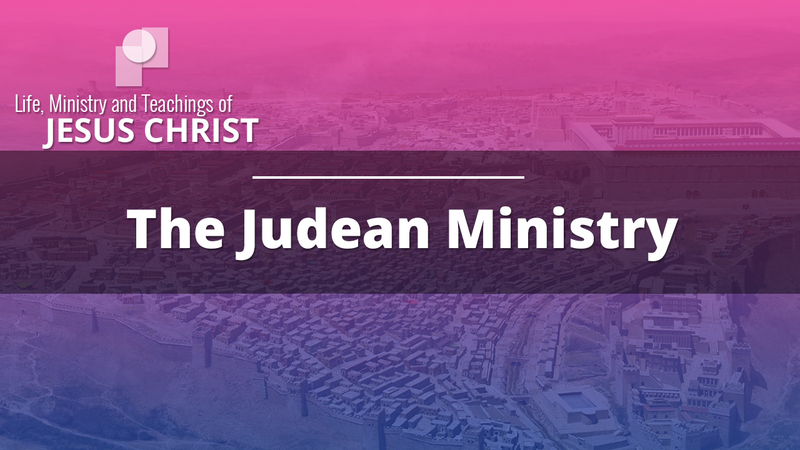 The cultural, political, and social realities in Judea, Samaria, and Galilee during Greco-Roman times were very different than many Bible students envision. The different types of Judaism during this period were not what is thought of as Judaism in today’s world. Different threads of thinking divided the populace into contentious religious factions. We get a flavor of this division through the New Testament as we read about Pharisees, Sadducees, and Hellenists. Most people were simply not that religious at all, though they lived and breathed the history of God’s work with them through the Law, Prophets, and Writings. In terms of daily life, the dominant influence was Greco-Roman. In other words, the political system under which they lived was the Roman Empire, but the Greek culture was all-pervasive. It was a world of intense poverty, violence, and inhumanity, where human life was of little value and ignorance was rampant. Greco-Roman civilization was cruel, violent, oppressive, and supremely pagan. Women’s and children’s rights were virtually non-existent. War, slavery, and brutality were ever-present. 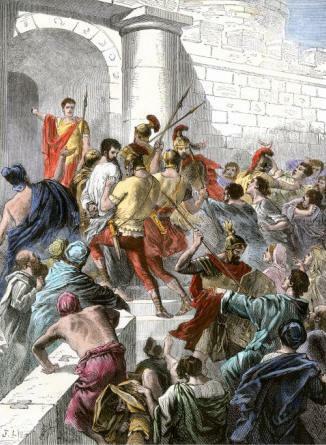 The Jewish people accounted for about seven million, or roughly 10-15% of Rome’s subjects. A Jewish synagogue could be found in almost every sizeable Greco-Roman village and city. Substantial Jewish communities populated Spain, Egypt, Asia Minor, and Italy. About a million Jews resided in Egypt, with over 200,000 in the city of Alexandria alone. Some two million Jews lived beyond Roman borders to the east as far as India and south into Ethiopia. About one million lived in the land of Israel, referred to as Eretz-Israel, residing in Galilee and Judea. The Gospels introduce a Jewish motherland afflicted with widespread poverty and sickness wherein the common people lived in misery, suffering and despair. Physical and mental illness was not uncommon. A heavily taxed population resenting Gentile dominance yearned for freedom. At the beginning of His ministry, “Jesus came to Galilee, preaching the gospel of the kingdom of God, and saying, ‘The time is fulfilled, and the kingdom of God is at hand. Repent, and believe in the gospel’” (Mark 1:14–15). The word “kingdom” means government. Jesus was talking about the coming government of God over this earth. He commanded: “REPENT, and believe in the gospel!” To “repent” means to be so sorry that you are not only willing to quit, but to turn around and go the other way. Of course we must repent of SIN. But what is sin? God answers: “Sin is the transgression of the law” (1 John 3:4, KJV). So we must repent of disobeying God’s Government — of breaking His LAW! Again, notice Jesus’ own inspired words on the subject: “Do not think that I came to destroy the Law or the Prophets. I did not come to destroy but to fulfill” (Matthew 5:17). In other words, Jesus in His own life perfectly performed the spiritual intent and purpose of God’s law. Why did He do this? Let God answer! 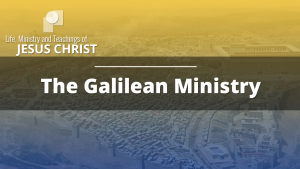 The gospel writer Matthew describes Jesus’ ministry in Galilee. What gospel did Jesus preach? “And Jesus went about all Galilee, teaching in their synagogues, preaching the gospel of the kingdom, and healing all kinds of sickness and all kinds of disease among the people” (Matthew 4:23). Later in the book of Matthew, we see that Jesus continued to preach the gospel of the kingdom! “Then Jesus went about all the cities and villages, teaching in their synagogues, preaching [what?] the gospel of the kingdom, and healing every sickness and every disease among the people” (Matthew 9:35). So, we see the clear historical record of Jesus’ preaching the gospel, the gospel of the kingdom. The gospel writer Mark further describes the gospel this way: “Now after John was put in prison, Jesus came to Galilee, preaching the gospel of the kingdom of God, and saying, ‘The time is fulfilled, and the kingdom of God is at hand. Repent, and believe in the gospel’” (Mark 1:14-15). Jesus ate His last Passover meal in the “Upper Room” with His followers (Mark 14:15; Luke 22:12). Throughout the Apostolic Age, the ancient Church of God celebrated this event from the perspective of the night of this Last Supper. The symbols of this New Passover consisted of unleavened bread and wine (symbolic of Jesus’ broken body and shed blood). Jesus introduced these New Covenant symbols at the beginning of Nisan 14, the Tuesday evening before His death. The first-century order of service at the New Passover included a foot-washing ceremony followed by the ritual partaking of unleavened bread and wine. Early Christians continued to keep the New Passover, annually, at the beginning of the fourteenth day of the first month, called Abib anciently and Nisan in Jesus’ day, determined by the priestly lunisolar calendar. We call it the New Passover or Christian Passover herein only to distinguish it from the Passover of the Jews, which was observed at the beginning of Nisan 15. The first Christians presumably simply referred to it as Passover. It’s important to note that the followers of Jesus kept the very first Christian Passover on a Tuesday evening, a full twenty-four hours before the traditional Jewish Passover on Wednesday night. The Christian Passover was set as an annual event, at the beginning of the fourteenth of Nisan, observed at the hour set by Jesus. It is vitally important that we understand the significance of the Passover. God gave the Holy Spirit to His Church on the Day of Pentecost in 31 CE. 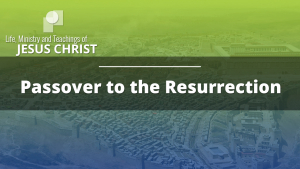 It had been an unforgettable 50 days for Christ’s disciples. Their Teacher had come back from the dead after a brutal execution, and had taught them for 40 days. More than 500 at one time had seen Him (1 Corinthians 15:6). The disciples ate with Him, talked with Him and even touched the wounds where His body had been pierced. But that was not all. After 40 dramatic days of instruction, the Savior ascended into the clouds, while His disciples watched with wonder and amazement. But He did not leave them alone—He promised to give them something that would empower them with spiritual vitality they had never before experienced (Luke 24:49). Luke describes Christ’s encouraging words. “And being assembled together with them, He commanded them not to depart from Jerusalem, but to wait for the Promise of the Father, ‘which,’ He said, ‘you have heard from Me; for John truly baptized with water, but you shall be baptized with the Holy Spirit not many days from now'” (Acts 1:4–5). This momentous 50th day was the day of Pentecost—the day of miracles—the day the New Testament Church began! What happened on that amazing Day of Pentecost in 31 CE? On the day of Pentecost Jesus’ followers were seated (Acts 2:2) in a building. The notion of them meeting in the “Upper Room” where Jesus instituted the Christian Passover is a myth. The Temple Court, a single structure about one quarter of a mile in circumference, was a massive complex with hundreds of rooms. The colonnade at the southern wall, known as the Royal Stoa or Solomon’s Portico, was its probable venue as it was open toward the Temple court. Its exposed access allowed for people in the Royal Stoa to be easily seen and heard from the outside the colonnade. The apostles then were immediately accessible to Jews and proselytes gathered for the festival. Luke was “a witness” of the events recorded in Acts 19:23-28:3, as evidenced by his use of the second person singular tense “we” as opposed to the plural “they.” As a result, we find considerable detail in this section of Acts. “You see, brother, how many myriads of Jews there are who have believed, and they are all zealous for the law; but they have been informed about you that you teach all the Jews who are among the Gentiles to forsake Moses, saying that they ought not to circumcise their children nor to walk according to the customs. What then? The assembly must certainly meet, for they will hear that you have come. Therefore do what we tell you: We have four men who have taken a vow. Take them and be purified with them, and pay their expenses so that they may shave their heads, and that all may know that those things of which they were informed concerning you are nothing, but that you yourself also walk orderly and keep the law. But concerning the Gentiles who believe, we have written and decided that they should observe no such thing, except that they should keep themselves from things offered to idols, from blood, from things strangled, and from sexual immorality” (Acts 21:20-25). The Apostle Paul’s ministry included three apostolic tours in the regions of Asia Minor and Greece where he evangelized, raised up congregations and ordained elders. The First Apostolic Tour (46-48 CE) began in Antioch of Syria. From Antioch Saul (soon to be called Paul), Barnabas and their party went down from a higher to a lower elevation, to Seleucia. 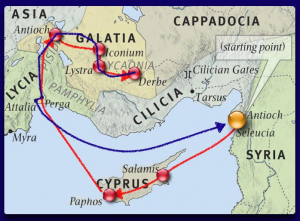 From there they sailed for Cyprus (Acts 13:4). Arriving at Cyprus at the port of Salamis they proceeded to preach in various synagogues of the Jews. They were accompanied by John Mark, a cousin or nephew of Barnabas, who acted as their assistant (Acts 13:5). Traveling through the island, they arrived at Paphos where they encountered a sorcerer, a false prophet, who was a Jew known as Bar-Jesus, or Elymas. He was with Sergius Paulus, the Roman proconsul. At the request of the proconsul, Barnabas and Saul appeared before him as he sought to hear God’s word (Acts 13:7). However, Elymas “the sorcerer,” withstood them seeking to turn the proconsul away from the faith (Acts 13:8). Our Living Education courses build an engaging understanding of the Bible by following a step by step modular approach to learning. As a student, you will participate in reading, viewing course materials, and taking a short quiz as you expand your Bible knowledge.